For the last 4 years, working on The Witness and Twelve Minutes at the same time, besides being exhausting, it forced me to give up on a lot of activities that I love doing. 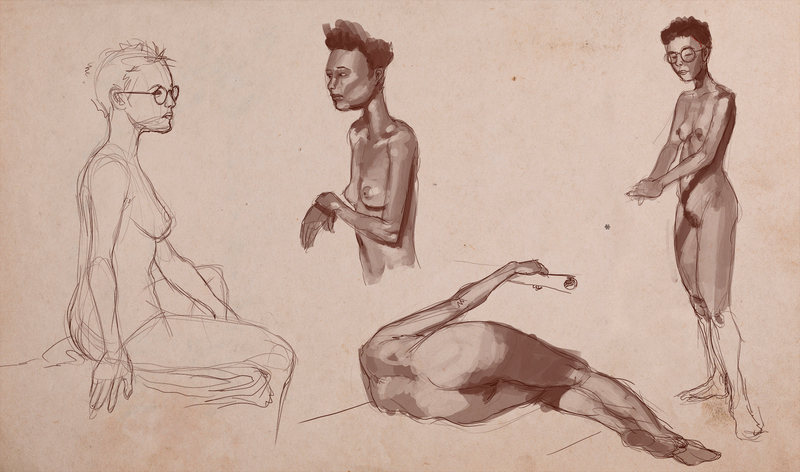 One of them is Life Drawing, so once I knew I was going full time on Twelve Minutes, my first goal was too get back to it. There is an awesome studio close to my place and today I had my second session. I have a Cintiq Companion 2 but never had the chance to properly use it, so I decided to try and do this 3 hour session uniquely with the tablet and using Krita. For those that don’t know, Krita is an amazing free software that totally kicks Photoshop in drawing and illustration. It has a robust brush engine and proper color selection and drawing tools that for some reason Adobe never cared to add, even if they are so obviously needed. Here are some of the drawings from the session. Quick one minute poses. The two that I managed to get some facial details were 5 minutes. These were 10 to 20 minutes poses. Still trying to get the hang of the brushes in Krita. Parabéns por esse regresso ao desenho de modelos e ao teste da Cintiq Companion 2. Nunca perdeste essa vontade e treinar a mão e realmente é muito importante.